locomente...: Miles to go Before I Sleep! I had relocated from a small town to a metropolitan recently. Thanks to my first job! I was scared like a mouse, yet I walked with confidence. The noise and crowd was new. I know that the chosen path is not easy. But, I wanted to evolve and see the World around. I wanted to be independent. I may have to adapt and adjust a lot. And I was ready for that. 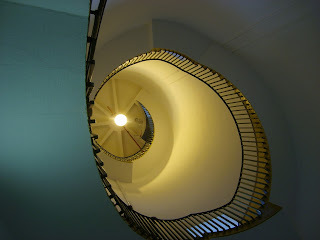 As I strode towards the lobby and looked up, I saw the familiar spiral staircase. Its design reflected my mind. “Miles to go before I sleep”, I thought. Stepping out of the comfort zone is never easy, is it? Well told. A move of this sort is definitely a big step! I can feel the anxiety and hope in your piece. One thing that would improve this would be to put the two part of this together: "I had relocated from a small town to a metropolitan recently. Thanks to my first job!" You could say "I relocated from a small town to a metropolitan area recently thanks to my first job" or reverse it and say "Thanks to my first job, I recently relocated from a small town to a metropolitan area." I like the mmix of confidence and fear you protray here. Perfect for someone wanting to move on but nervous about what they will find. Welcome to the Fictioneers! I like your story of relocating somewhere new and strange, came across really well.